It is your sanctuary. It is the place where you display your tastes and interests to others. Yet as time goes on, those tastes and interests change. The room that once represented you best only embodies your past. So, you’ve decided to alter up your living room and convert its appearance. Now what? Well thankfully, you don’t have to resort to any major changes. That couch doesn’t have to be swapped for a new one, and you don’t have to start tearing down the wallpaper. There are plenty of simple ways to rejuvenate the look and feel of the living room without excessively investing your resources and time. So without fluffing out this introduction any longer, here is a run through of five trouble-free methods to transforming your living room. Lighting is such an integral part of any living room. Whether natural or artificial, light sources can have a big impact on a room’s vibe. In terms of natural lighting, you should be looking towards maximizing this particular detail as much as possible. More than just opening the curtains, you should ensure no obstacles like furniture are restricting the flow of daytime lighting. A little trickier to solve is the conundrum of artificial light. With this kind of light being used later in the day, the aim should be to go for a warm, soft mood – it is a room for relaxing, after all. If you want to reduce the light being produced (without actually turning the lights off), you can either position any lamps you own in a different location, make use of bulbs that have a lower watt, or you could even install a dimmer device if you don’t already have one. A chair-centric website suggesting some funky chairs could freshen up the look of your living room? But hear us out. Cool chairs are, as the name suggests, cool. They offer a level of individuality that can truly turn a room from ordinary (aka boring) to unique (aka awesome). Think about it: what stands out more, a generic flat pack chair or one that has distinctive characteristics? The latter is, or course, the correct answer. So much so in fact that a unique chair, whether it is shaped like a hand, egg or whatever else you can imagine, can become the focal point for your living room. Plus chairs in this mold don’t have to necessarily match other furniture in the same setting such as sofas, so there isn’t necessarily a restriction on what you can and can’t buy. Sales pitch over. Discover the latest cool chairs here at Really Cool Chairs. Speaking of sofas, there’s an incredibly easy – and inexpensive – way to revitalize such a piece of furniture without going to the extent of purchasing a new one: add some throw pillows. Pillows have a level of versatility where they can create a certain tone and style in an instant. Whether you are aspiring for sophistication, warmth, uniqueness, and so on, placing them on a sofa can help to refresh one of the main aspects of your room effortlessly. They are not just for couches, either. Remember those oh-so-cool chairs we were talking about earlier? You can stick a cushion on it to add another impressionable dimension. Or you can even cut out the middle man, obtain an oversized pillow and make that the extra chair for your room. As you accumulate possessions over the years, you tend to get a house full of clutter – which can spill over into your living room in an almost inconspicuous fashion. De-cluttering can be as easy as clearing a shelf of books or removing that rarely used coffee table. If you haven’t got a use for something and it isn’t enhancing your living space in any way, get rid of it. More space can do wonders for invigorating your room and house as a whole. And hey, at the very least you’ll have fewer things to dust! As the old adage goes, ‘less is more’, and that is certainly something to keep in mind if you are beginning to feel suffocated by the belongings in your living space. Changing your living room flooring is, as I’m sure you know, a massive undertaking. 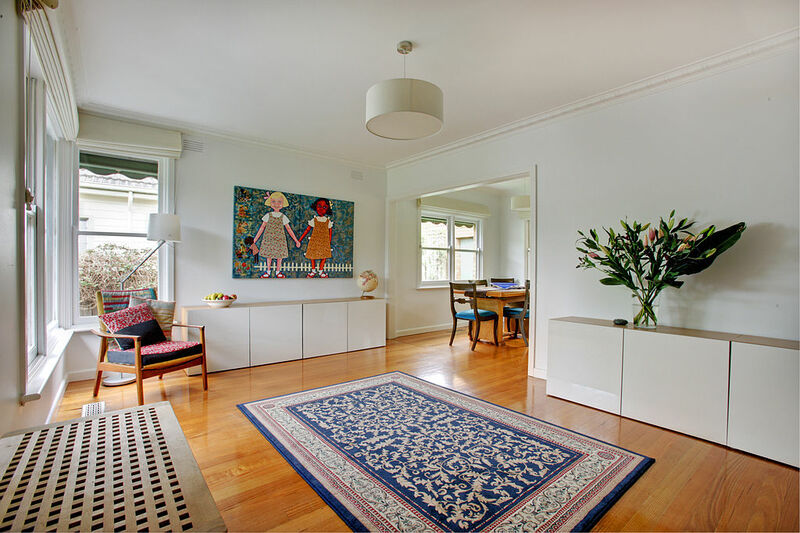 Not only is it a sizeable outlay of your hard-earned cash, but it is a time-consuming affair when it comes to uprooting your old floor and laying down a new one. Yet doing that can help to transform your living room. Then again, the key operative word of ‘simple’ in the title means it isn’t an appropriate choice for this very blog post. Obviously. A choice that is appropriate, however, is a new rug. With that said, the rug of choice for your particular abode is down to the living room itself and the look you are after. Get the right rug, slap it down on the floor and boom: you get an explosion of style and atmosphere that can help to, you guessed it, transform your living room for the better. Image courtesy of Tim Collins under the Creative Commons license. Can you think of any other ways to transform your living room? Please comment below.